It’s a real team effort with my dad, Garrett, my siblings, in-laws and Lucy (of course) helping us make this dream happen. 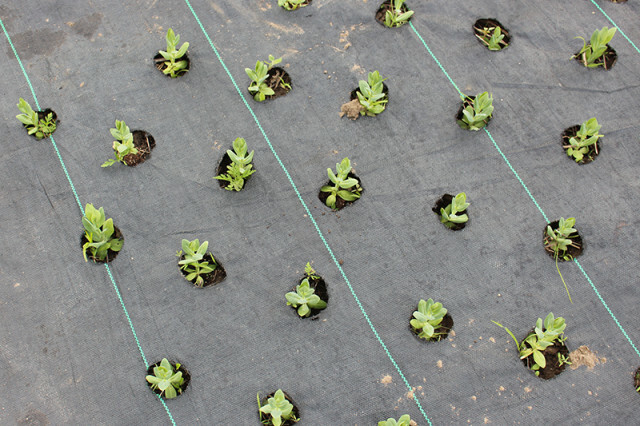 Back in May, I shared how we were doing a new (to us) method of flower farming, where you cover the field in heavy-duty landscape fabric, staple it down, burn holes in the fabric and plant your seedlings. 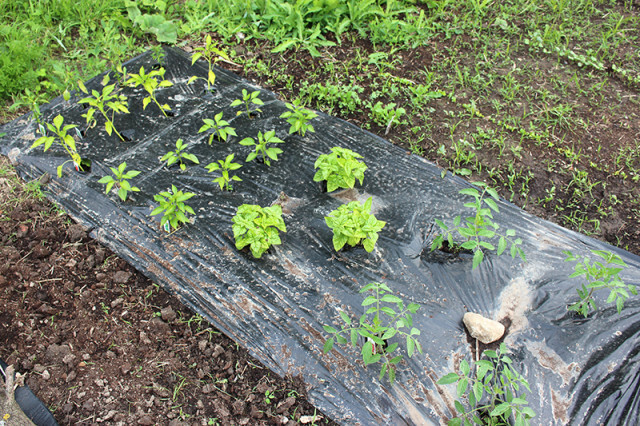 This method is a HUGE improvement from last year, when we had to wade through the weeds to find our flowers. It would take us 2+ hours to weed one plot last year and my mom and I were able to do almost the entire field in that same amount of time last week. The fabric truly paid for itself on the first day of weeding this year. 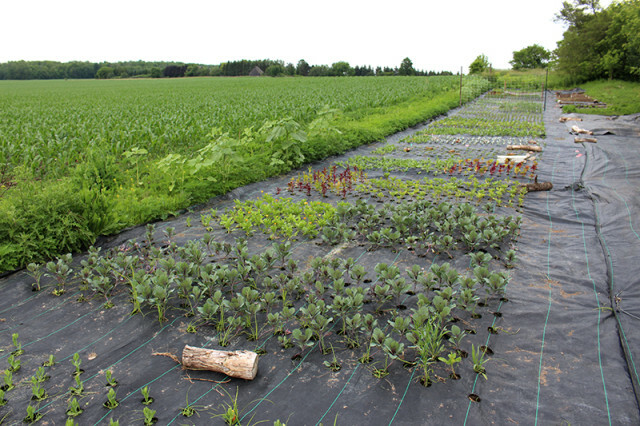 In the areas where we will be doing succession planting, we’ve covered the ground in the landscape fabric, for now, to help keep the weeds down. You can see the large black pieces in the top left side of the field. 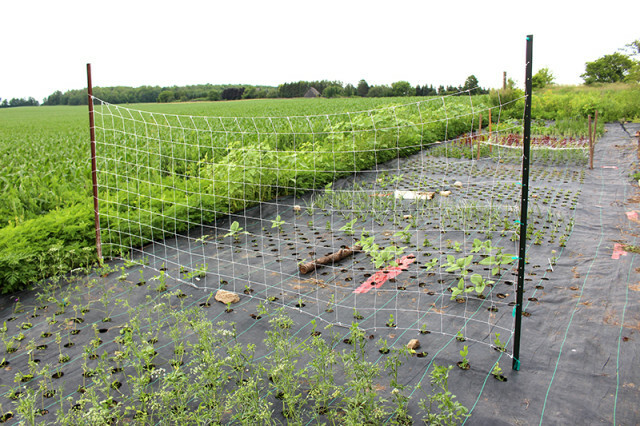 After a very cold, windy spring that left us pretty worried about stressing the seedlings, everything finally started to really grow this past week with the ideal combination of heat and rain. Last year we had a horrible drought, where it only rained twice all summer, and now this year we’ve had rain several times a week…and almost always on our farmers market day, ha! 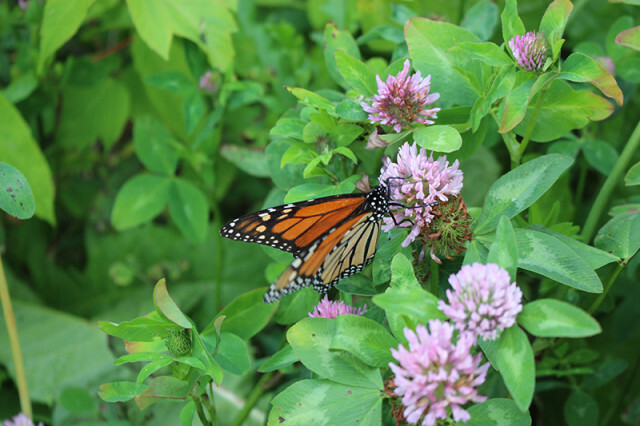 All spring we’ve been using our perennial plants (peonies, irises, spirea, dogwood, ferns, daisies, etc), but this past week we had our first flowers from the field. These bright blue bachelor buttons were the perfect addition to our farmhouse jars. Our dahlias have started to bloom too – making a lovely colour combo for Canada Day next weekend! One very welcome surprise we had this spring, was all these sunflowers that are growing along the perimeter of our field. We have easily a hundred of them…and we have a pretty strong suspicion of what happened. 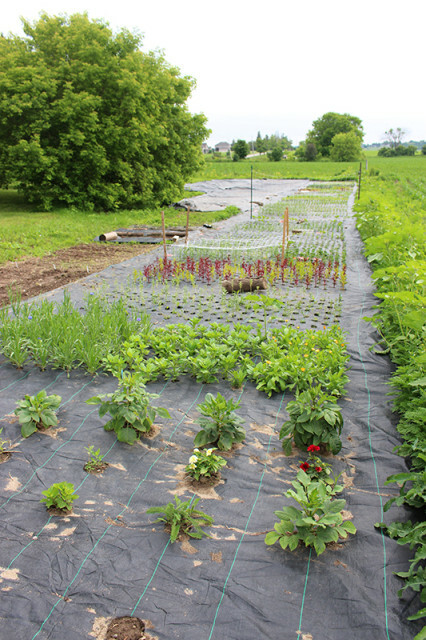 We planted hundreds of seeds last year that never germinated. We originally thought they’d been eaten by visiting birds, but now we’re thinking that they just never had a chance last year with the horrific drought we had. We first started to see them come up a few weeks ago and almost mistakenly pulled them out while we weeded. Now they’re already a couple feet tall and we hope it means we’ll have a nice early crop of sunflowers while our seeds from this year continue to grow. We planted a large variety of sunflowers last year, so we truly have no idea what kinds these we’ll be, but I hope a few of my favourite teddy bear sunflowers make an appearance. While I was tilling up the area for our edible flower mix, we decided to plant a vegetable patch for us to share as well. 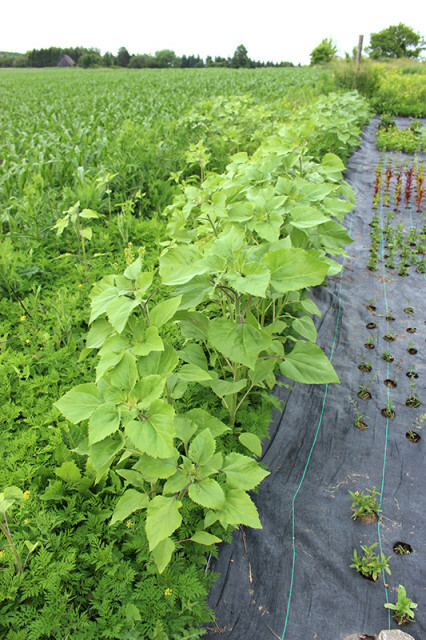 I used organic biodegradable plastic for the vegetables, as we had great success with it last year. So far we have four types of peppers, three types of tomatoes, three types of basil, sage, spring mix, spinach, kale, lettuce, radishes, beets, snap peas, beans, carrots, dill, parsley, cilantro, eggplant, zucchini, acorn squash, hubbard squash…and I’m sure a few other things I’ve forgotten. We loved having a vegetable garden last year, and I’m hoping that I can keep it well watered and weeded this year so we can enjoy it all summer. Last year I had such good intentions, but it was difficult with a newborn in tow. Let’s see how I do with a one-year-old to chase after now, ha! 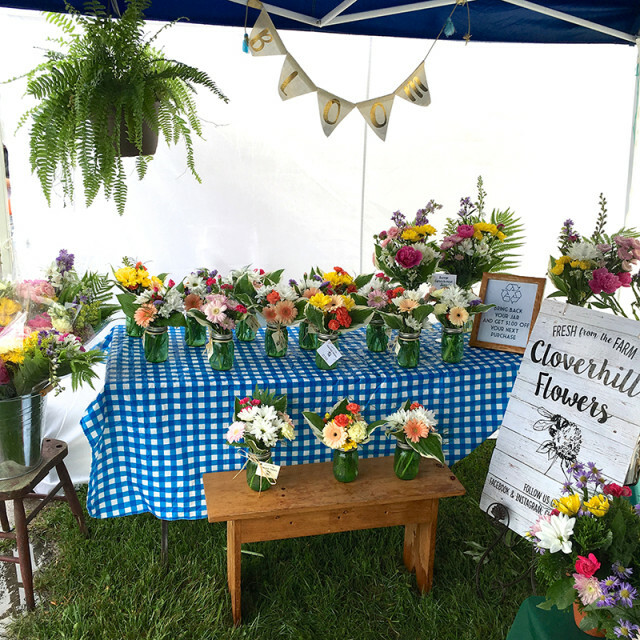 It feels like we’re only a few short weeks away from having a field in full bloom and I’ll definitely be sharing updates here and on the Cloverhill Flowers Instagram. 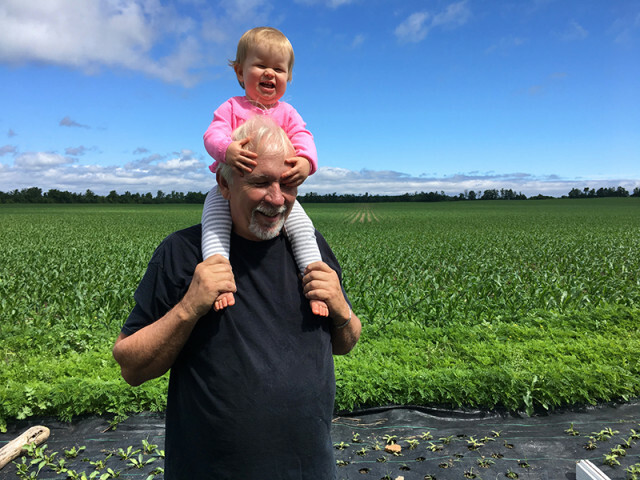 Our farmers market starts in May and we won’t see most of our field flowers really coming into their own until mid-July, which means we’ve had to buy wholesale to fill the gaps in the meantime. 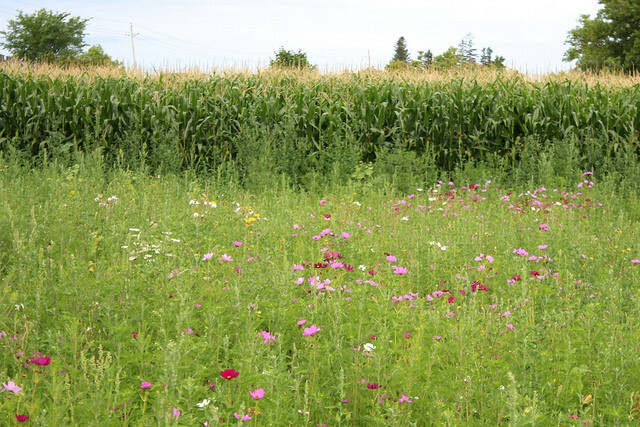 We still aim to get mainly flowers grown in Ontario and Canada, and we use what we can find locally as much as possible. I love setting up our booth each week with colourful blooms. 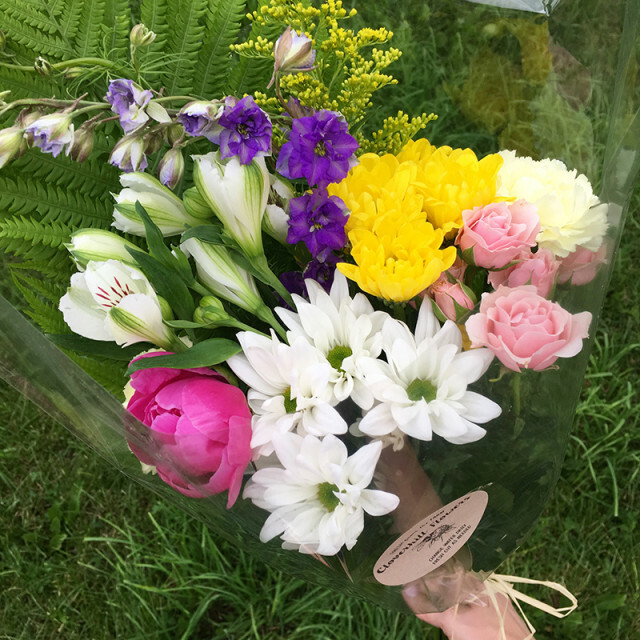 Every week we hear from customers who have given our flowers to loved ones and how they were well received – which is the biggest compliment. 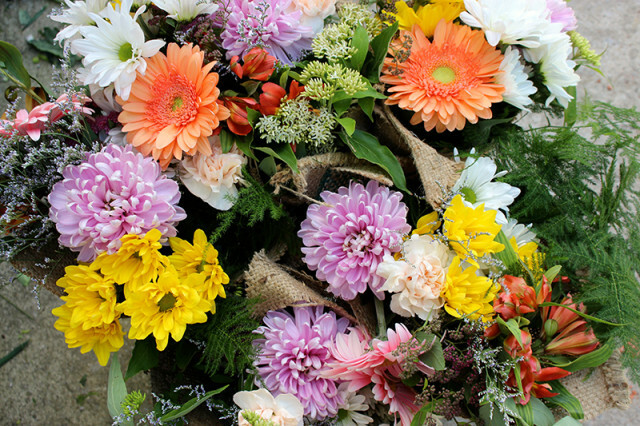 We lovingly make these bouquets, posies, jars, arrangements, and pots to brighten other people’s days. 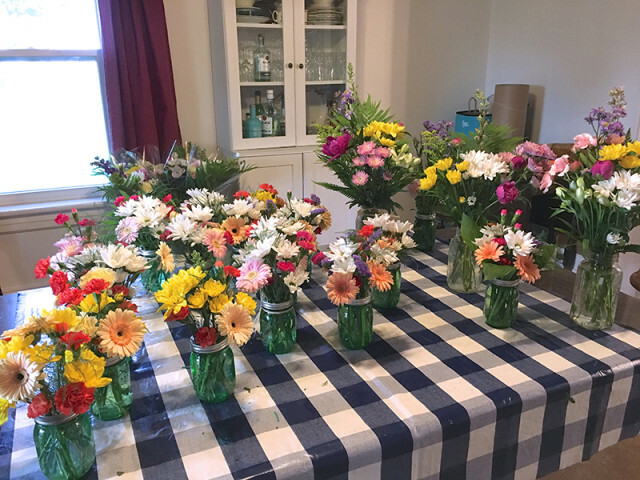 Every week, we harvest whatever flowers we have in bloom and pick up what we still need, then head to the farmhouse for a big flower arranging party for two. Yes, it is work, but getting to hang out with my mom/best friend/business partner for an afternoon while we play with flowers is always a blast…especially when it works out around Lucy’s nap time. She’s really taken to having her lunch in the high chair right beside us while we work. 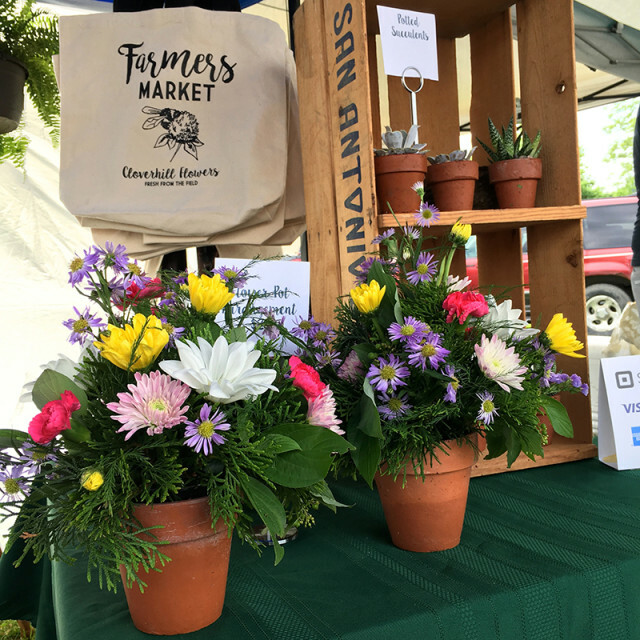 Then on Sunday morning we load up our cars with fresh flowers and bring them to market, where we get to meet so many great customers and chat with our fellow vendors. It is really a huge social event every week, and for someone who has just moved back into this community a couple of years ago, I love getting to connect with so many people. Even on the really awful rainy days (and there have been loads of them this year), we have lots of fun. Who can be down when they’re surrounded by flowers, live music and friendly neighbours. I’m inspired! Absolutely gorgeous ?